Pomegranate oil is a perfect choice for oil cleansing. It is loaded with flavonoids and punicic acid ( a certain type of polyunsaturated oil), which cumulatively soften and penetrate the epidermal layer of the skin. As a result, it becomes easier to cleanse the skin and nourish the underneath layer all at a time. Though suitable for all types of skin, pomegranate oil especially hydrates and moisturizes dry, dull, and lifeless skin very well. The high punicic acid content of the oil helps it go deep into the skin and work as an emollient. It restores the natural moisture of the skin and seals it in so that you can get rid of the cracked skin and dry patches easily. Pomegranate oil is high in antioxidants (ellagic acid, tannins, and anthocyanins), punicic acid, and omega-5 fatty acids, which contribute to its excellent anti-aging qualities. It combats damaging free radicals and stimulates the key cells called ‘keratinocytes’ present in the epidermis, thereby minimizing the appearance of signs of aging (fine lines, wrinkles, age spots, etc. ), reversing existing skin damages, and invigorating the entire skin for a bright, youthful look. 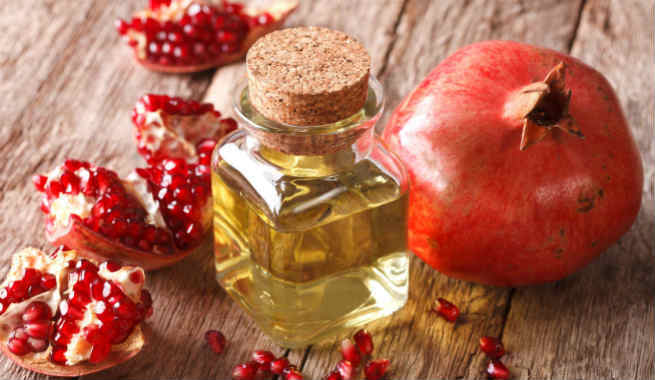 When it comes to preventing the sagging of a mature skin, pomegranate oil works wonderfully. It contains tons of antioxidant vitamins like vitamin A, C, E and K, which avert oxidative damages and make the skin more elastic. Among these, vitamin C is known to be the most effective one in boosting the production of collagen, reducing its breakdown, regulating moisture balance, enhancing skin tone, and giving a natural facelift to the aging skin. Pomegranate oil suits oily and acne-prone skin very well. It can unclog skin pores by removing debris efficiently and nourishes the skin without leaving any oily residue. As a result, you can expect to get rid of your existing breakouts while lowering the chances of developing them further. Moreover, it is a good anti-inflammatory agent that soothes acne-related irritation as well as decrease scarring at the same time. 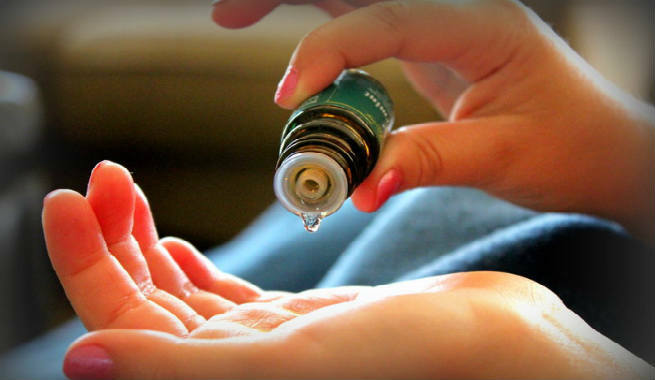 Heals skin infections and other major conditions like eczema, psoriasis, etc. with its excellent moisturizing properties. Improves the overall health of the skin by enriching it with vital vitamins and minerals. Gives a flawless look by making the skin softer, smoother, and fresher. Prevents skin cancer through its antioxidant properties. Using pomegranate oil on your scalp is good for getting it cleaned and clarified. 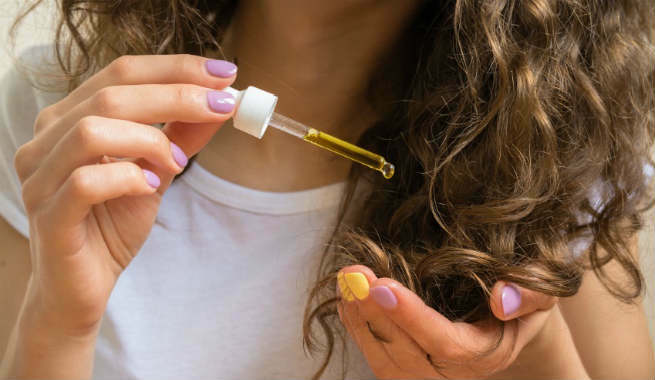 The oil helps in unclogging the hair follicles by removing debris so that the growth of the hair fibers becomes smoother and easier. Pomegranate oil is a rich source of vitamins and antioxidants, which are essential for making blood vessels stronger and stimulating the circulation of blood throughout the scalp. The oil also helps in maintaining the pH balance of the scalp so that it does not develop too much buildup. All these help in making the scalp healthy for growing a healthy mane. Use pomegranate oil as a dry hair treatment and your mane will be revitalized naturally. It not only moisturizes dry, frizzy locks but also helps in protecting them from environmental pollution. When mixed with a carrier oil and used as a hair tonic, pomegranate oil nourishes our hair deeply. It feeds hair fibers by supplying enough nutrition to them as well as provide lots of oxygen to their roots by stimulating blood flow to the scalp. If you need to grow your hair longer, stronger, and faster, pomegranate oil can be your savior. It boosts blood circulation all through the scalp, strengthens hair follicles, and nourishes hair fibers so that the speedy growth of the mane is ensured. Pomegranate oil has anti-fungal and anti-inflammatory properties, which help us eliminate dandruff-causing fungi from our scalp and keep all other related issues like flakiness, itching, hair thinning, hair loss, etc. at bay. Besides, pomegranate oil also repairs split ends of hair and improves the texture of hair by making it softer, smoother, shinier, and more gorgeous. So, are you ready to give pomegranate oil a try as a beauty ingredient?